In the last blog (http://www.itstimetogetorganized.com/what-does-not-belong-on-your-desk/) we explored why cluttered desks make it hard to focus on the task at hand and what you can do about it. When you have to push things aside to find a clear spot, you know it is time to tackle the desktop clutter. 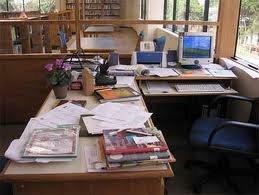 Statistics show that co-workers admit to being judgmental and assume that the owner of a messy desk is lazy. While we would not necessarily jump to that conclusion, that is the general feeling of the people with whom you work. When clean space on the top of your desk is hard to come by, it may be time to take a look at the offenders — the items on your desk that are usurping valuable space. Unless they’re paying rent (which of course they are not) they belong somewhere else. It is your desk, isn’t it? Before jumping into this project and bulldozing everything in sight on your desk, take a step back and decide what to do with these items. The “keep” items need a permanent home. (Your desk is their temporary home.) Moving everything to the right place requires thought ahead of time and a plan of action. You may decide to tackle this project on off-hours — later in the day or on a weekend — to minimize the interruptions that invariably come up. It will require focus. Keep the current project on the desk top — Other on-going projects can be relocated to a nearby desk drawer or placed on the desk in a step (or tiered) organizing unit. As long as they are not in the way and do not throw you off track, both options are fine. Decide where they should go. Most people have no idea what to do with them so they end up under piles in various corners of the desk. If they are no longer needed or are now in electronic form the answer is obvious. Consider adding them to the folder belonging to the specific project. Create a folder and label it “meeting notes”. Now you will know where to look when you next need the information. Scan them to an electronic folder with a descriptive name and throw out the paper notes. Gather them together and decide which ones to keep. Add a few phrases on the back of these cards reminding you where you met, what the other person was wearing, what you discussed, or if there was any follow up. These clues will help you remember the discussion. Place the cards in one location such as a small box. That is a far better solution than leaving them scattered all around your desk and credenza where they can be lost. When we work with clients, we find them on top of the desk and every other flat surface in the office plus thrown in drawers. Many people return from a networking event or meeting and do not know what to do with them. Enter the cards into contacts. Include the notes you made on the back of the card. Microsoft Outlook and other CRMs include note sections where you can provide information about the person and the meeting. Use a scanner when there are a large number of business cards. It is a lot faster. Confine incoming mail to a box that sits on the corner of your desk. Without a home for mail, it will end up strangling your desk (and maybe you, too). Designate a place somewhere else other than the top of your desk for your keys, wallet, smart phone, articles to read, documents, a briefcase and/or a purse. These types of items belong in a desk drawer or in a filing cabinet where they are out-of-sight and safe. Clients typically want to know what is acceptable. Of course, a photo or two is a nice addition to your desk and helps you remember why you come to work in the morning and why you leave in the evening. We recommend displaying a few special pictures — that’s all. Take away most, if not all, decorative items that sit on your desk. Donate or take home most knick knacks, especially if they have no meaning and you do not remember where they originally came from. Rotate your personal items regularly to keep your desk looking fresh and interesting. Designate an out-of-the-way spot so they do not need to be continually shifted about while you are working. Also, it will be easier to remember your cell phone or tablet when you leave the office if they are in the same location every time. Find a spot off your desk, if possible, for your scanner and printer. Or, at the very least, relocate them to a corner of your desk. These items are often big and bulky and take up valuable desk space. Just be sure they are handy to reach. Extra pens, pencils and notepads are annoying if it is necessary to move them from spot to spot every time more desk room is needed. Instead, stash them in a drawer, move them to a supply cabinet or give them away if you are unlikely to use them.Many organizations or schools can always use these types of supplies and are grateful. And, yes, they are a tax deduction. While essential for keeping a desk clean, storing unattractive bottles and cans on top of your desk is not a pretty sight. Find someplace else. As much as we find binders very handy, they take up a lot of room on a desk. Move them to a bookcase or arrange them on a shelf above your desk, if you have one. 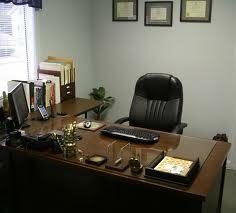 Bonus Tip: Take a few minutes before you leave at the end of the day to clear off your desk and make it presentable. When you walk into the office the next day, you will be able to find what you need and can get down to work right away. There will be no down time and you will be off to a good start of the day. How nice! What Does NOT Belong On Your Desk? Often items strewn on your desk get in the way, literally and figuratively. Many items do not belong on your most valuable piece of real estate. You probably have no idea how they got there in the first place. Papers, business cards, file folders, coffee cups and an assortment of pens scattered about can easily distract you from the task at hand. When it is hard to focus, it is hard to achieve your personal best. Clutter and extraneous items take you off course and reduces efficiency. Below is a step-by-step plan for a functional desktop that will help you stay productive throughout the day. Prepare for your desk clean-up ahead of time. 1. Choose a date and enter it into your planner. 2. Decide where items should be relocated. One of the reasons we end up with so much on our desk is that they have no home. A lot of things currently on your desk may end up in the trash so begin thinking about homes for magazines, project folders, meeting notes, business cards, personal items and extra supplies, to name a few. 3. Secure a large trash bag. Now the day has arrived for you to begin. Decide what to toss and what to keep by glancing quickly at each document. If you stop to read each one, it will slow you down and can easily get you off track. 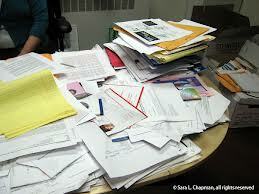 Divide the “keep” papers into two piles: active and reference. Place active documents into a file folder with similar items and keep in easy reach either on the desktop in an organizing unit that has “steps or tiers” or a close by desk drawer right next to you. Because you may not go to reference materials as often, they can be kept farther away such as across the room. Store documents electronically instead of keeping paper. First, however, devise a plan for the location of electronic files. The last thing you want to happen is to lose an important document because it was misfiled. Also, do not forget to backup. Toss or shred the paper documents once a copy resides on your computer and the original is no longer needed. Stash these bits of information into electronic software such as on-line post-it notes, One-Note, EverNote, or even the computer desktop. Or store the information in a binder in an easy-to-reach location. Read a magazine at lunch or while waiting for an appointment. Before leaving on a plane trip, I stuff my briefcase with unread magazines. Out they go as soon as I read them; no magazines make the return trip. Pass them along to doctors’ offices, the Y, hospitals and places where others can enjoy them. Project Files … Meeting Notes … Business Cards … Mail … Items To Take Home … Personal Items … Miscellaneous Items … Electronic Devices … Supplies … Cleaning Supplies … Books and Binders. Isn’t it amazing what your desk can hold?